James was born on the 11th February 1884 in Salford, Lancashire. We don't know anything about his early life or family. In early June 1901 James joined the Militia. This meant that he would train as a soldier for a short period every year, and live as a civilian for the rest of the time. He joined the 6th Battalion of the Manchester Regiment and was given the service number 7898. The Boer War had been raging in South Africa since October 1899. Hundreds of thousands of British soldiers had been sent to the country to fight a far smaller number of Boer guerrillas. The 6th Battalion's turn came in March 1902. They saw little fighting, and spent most of their time manning blockhouses and the fences between them. These were intended to restrict the movements of Boer guerrillas, and force them to fight the British. It was a successful strategy and the war ended on the 31st May. The 6th Battalion returned to the UK that September. We don't know how long James spent in the Militia after the Boer War or anything about his civilian life. By the time the First World War broke out in August 1914, he was working as a postman. James left this job to rejoin the Manchester Regiment on the 11th December 1915. Conscription would be introduced at the end of the year so he may have wanted to volunteer, and choose the unit he served in, before this happened. When he reenlisted James was 5 feet 7 1/2 inches tall. He had a 'fresh' complexion, grey eyes and dark brown hair. He was given the service number 38819, although we don't know which unit he was assigned to at first. By August 1916 James was serving in E Company of the 3rd Battalion of the Manchester Regiment. This was a training unit based at Cleethorpes in Lincolnshire. We don't know how long he had been stationed there. James was sent overseas on the 12th January 1917. He served in France until the 22nd May, although because we don't know which battalion of the Manchester Regiment he served with, we don't know anything about what he did. He was returned to the UK because he had been wounded or taken ill. Despite treatment James did not recover enough to return to duty, so on the 30th March 1918 he was discharged from the Army 'on account of disablement or ill-health caused otherwise than by misconduct'. He was awarded a Silver War Badge with serial number 372824 to show that his discharge was honourable. On his discharge James was described as 'a sober, trustworthy, well conducted man, with a good record'. These words were written by the Officer in Charge of Infantry Records in Number 3 District; Quentin Bluhm. 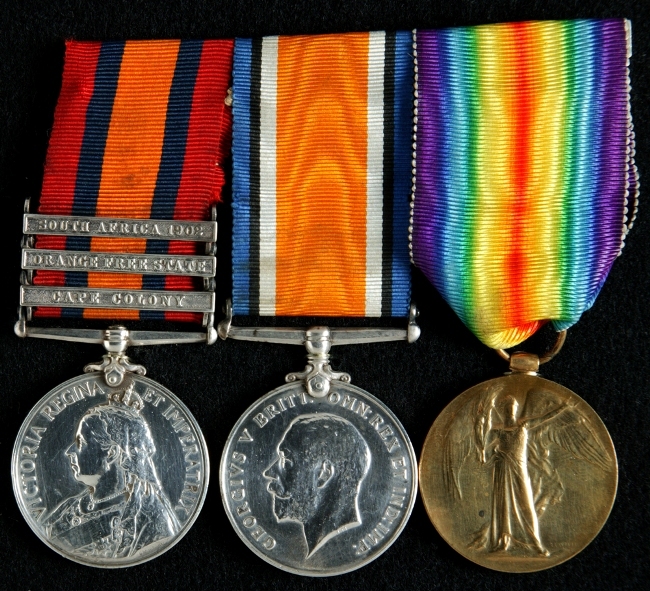 His medals are also in the Museum of the Manchester Regiment collection. The rest of James' life remains a mystery. 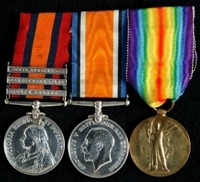 His medals were donated to the Museum of the Manchester Regiment in June 2010.